If you plan to be more than 1 for that class, please let us know in the instructions while booking. Extra guest : £60. The menu Italian Cooking Class is unavailable at that date. Chef La Belle Assiette - Cooking Class - London is unavailable on this date. 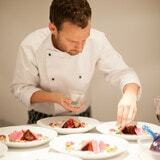 Check chef La Belle Assiette - Cooking Class - London's calendar. Chef La Belle Assiette - Cooking Class - London is unavailable in this city.